Taliesin Arts Centre is at the heart of Swansea University's Singleton Campus. In 2014 they celebrated their 30th birthday, having first opened in June 1984. Taliesin is named after the 6th century Celtic bard of the same name. The emphasis at Taliesin is on quality and innovation – providing a vital service to both students and the people of Swansea and acting as a regional centre of excellence. As well as events within the building, thanks to increased funding from the Wales Assembly Government and the Arts Council of Wales, they have begun to take their productions outside of the theatre, holding Dance Days, an annual festival in the city centre, and touring their own productions and co-productions to other venues across Wales & beyond. Neath Little Theatre aims to provide quality drama and learning opportunities to the people of Neath and surrounding areas. They have a proud reputation for good quality grassroots theatre and have picked up many awards over the years. They have built up a loyal and supportive audience, many of whom come to see every show. As well as their three annual main ‘Major’ productions (in November, March and May) they hold regular club nights on Thursday evenings at 7.30, designed to be learning experiences for members. Everyone is welcome to come to these as audience members and give constructive feedback as part of the formative experience. They have a thriving Youth Workshop section for Junior Members. The Other Room is a world-class producing house, making visionary, distinctive theatre like nothing else in the Welsh capital. It is a small space where young artists have the freedom to take big risks; that celebrates Wales as a bi-lingual nation; and where new Welsh plays go toe-to-toe with the most exciting modern drama. 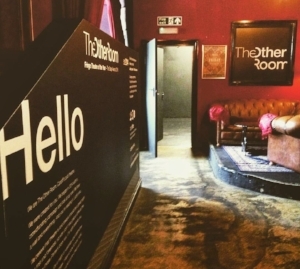 Founded in 2014, The Other Room is Cardiff’s first pub theatre. Within their purpose built space they run a year-round programme. They produce and curate plays, and their emphasis is on supporting the very best in Welsh and Wales-based artists. They are an intimate theatre of just 45 seats, and they bring audiences back to the live experience with an intensity no other venue in Cardiff offers.